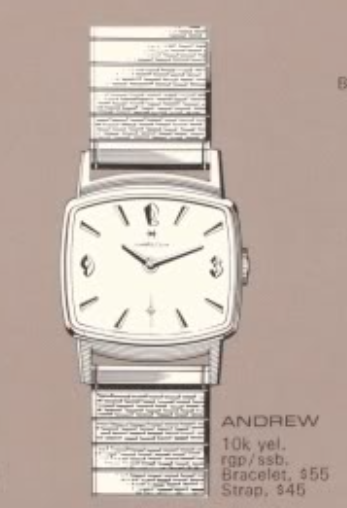 Did you ever notice how some watches linger on eBay for what seems like forever? Normally it's because they are common models, in lousy shape and priced ridiculously too high. If you track Hamiltons like I do, I'm sure you recall a few. I recently saw a watch for sale and although it was pretty beat up I was surprised someone didn't buy it. Eventually I got tired of looking at it, so I bought it myself. I thought it looked familiar but it turns out I hadn't seen one before. It was a 1968 Andrew. The Andrew was made in the last two years of US production and was an entry-level model with a 10K RGP bezel and stainless steel back. Inside is a Swiss-made Hamilton 686 manual winding movement. I wasn't too keen on buying the watch initially because it was missing it's crown and was very dirty. You never know what you're going to find when a watch is missing it's crown. However, I was pleasantly surprised to see that it was actually still with it's original Kreisler bracelet. So that was a huge plus. There is a remnant of a stem inside the hole but I'll have to open the case to see what I may have gotten myself into. Yuck... the bracelet has decades worth of "old man funk" inside the links. Oh well, nothing a half hour or so in the ultrasonic won't clear up. The dial is original and still looks good... a little dirty perhaps but not bad. The movement looks okay but I can see some rust peeking out from under the winding wheel screw. Yup, sure enough - rust under the winding wheel and the ratchet wheel as well. That should clean up okay though. It's funny to see how dirty fresh cleaning solution can get after cleaning just one watch. This watch was especially dirty though. Everything is cleaned and dried before being reassembled with fresh oil. There, that's a much better looking movement and it's ticking away nicely. Next stop is a visit to the timer. Nothing wrong with this picture - other than it's blurry. The watch is running great. The dial and hands go back on, as does the original bracelet. A replacement stem and crown return the watch to it's former glory. Originally I thought this watch would end up as a donor of parts but this turned out to be a great project.